New photographs of the former Soviet Union?s Lunokhod 2 rover on the moon, which is owned by an American millionaire, is causing a legal stir?over who can own what on the lunar surface. A powerful and sharp-eyed camera on NASA?s Lunar Reconnaissance Orbiter spotted Lunokhod 2 in several images, which were released amid a data flood from the spacecraft last week. The Soviet-era lunar buggy plopped down on the moon in January 1973, just one month after NASA?s final Apollo moon landing flight, Apollo 17. 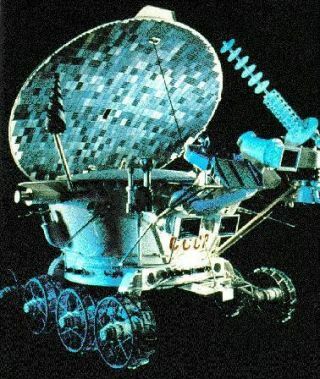 Once it rolled off its Luna 21 lander, Lunokhod 2 operated for about four months, tele-driven by controllers on Earth. The rover?s odometer chalked up 23 miles (37 km) of driving, steered over the lunar landscape while relaying panoramic images and thousands of television pictures. Lunokhod 2 is thought to have experienced an accidental death when it came in contact with a crater wall. That incident is believed to have showered the craft with lunar regolith ? or moon dirt ? that ultimately rendered the rover inoperable in mid-May 1973. Now, fast forward two decades in time. American entrepreneur Richard Garriott is a highly successful video game developer. He?s also a space aficionado and the son of scientist-astronaut Owen Garriott, who flew both a Skylab 3 mission in 1973 and onboard the STS-9 space shuttle mission on Columbia in 1983. In 1993, Richard Garriott purchased both the Soviet Union?s Luna 21 lander and the Lunokhod 2 rover. The deal was struck during a Sotheby?s space auction in New York. ?Friends and family kind of scoffed at me about plunking down about $68,000 on something I was not likely to ever see again in my whole life,? Garriott told SPACE.com in an exclusive interview. The attraction for Garriott was clear: ?I am now the world?s only private owner of an object on a foreign celestial body.? But today Garriott is in seventh-heaven given the new LRO images showing Lunokhod 2 on the moon. ?It?s great to actually have a contemporary photograph of my property on the moon,? he said. Furthermore, Garriott has had casual conversations with lawyers about international law and property rights on the moon. In the real moon space law, possessing Lunokhod 2 is one thing. But is it anchored on a piece of lunar land to imply a level of ownership? ?I think I can truly make the only private, legitimate claim to territory ? at the very least around my rover and, potentially, along its point of travel,? Garriott said, ?to give me some actual property rights on the moon.? Garriott added that his assertion is somewhat tongue in cheek. ?But it is interesting speculation?and I think that there?s already international framework to support that territorial claim,? he said. When he paid for Lunokhod 2 at Sotheby?s, Garriott said all he got back for his $68,000 was a photograph of a model and a receipt. For all that moon moola he made it known to Soviet space officials that he was hungry for something a little more clear and binding, as well as celebratory. The response is that Garriott now has a heavy-duty set of documents in both Russian and English, including a deed of title transfer as well as certification of ownership. Enter space lawyer, Joanne Irene Gabrynowicz. She is Director of the National Center for Remote Sensing, Air and Space Law and Research Professor of Law at the University of Mississippi. ?The soundness of a property right depends in large part on the integrity of the documents that memorialize the right,? Gabrynowicz told SPACE.com via email. ?This is why property buyers conduct title searches before buying property. They want to be sure that the title is good.? Gabrynowicz said that without reading the papers or knowing how they were processed and by whom, she can?t speak to the validity of the ownership of a space object purchased at auction. ?However, a contention that buying a space object that landed on the lunar surface from a sovereign nation gives rise to a property right to the territory under it is wrong,? Gabrynowicz said. Gabrynowicz said that States-Parties to the Outer Space Treaty of 1966 cannot acquire lunar territory by landing an object on the moon. ?The USSR was and Russia is a party to the Outer Space Treaty,? she added. ?It did not acquire the territory under the object when it landed. One cannot sell what one does not own. Since USSR/Russia did not have a property right to the territory under the landed object, there was nothing to sell.? Meanwhile, in the off-world space collectible business, Garriott?s acquisition of Soviet space hardware is enviable. But he?s already topped that. Garriott flew a self-financed, $35 million trek to the International Space Station in October 2008. Moreover, Garriott?s ongoing space passion includes serving on the Board of Trustees for the X Prize Foundation, which among its efforts is running the Google Lunar X Prize. The Google Lunar X Prize is a $30 million competition for the first privately funded team to send a robot to the moon, travel some 1,640 feet (500 meters) and transmit video, images and data back to the Earth. ?We?ve been putting together bonus prizes for people who go and photograph historic landing sites,? Garriott said. ?So I?m likely to help contribute to any bonus prize for anyone who happens to come over and visit my rover.? Garriott quickly added: ?But of course I?ll probably also make sure that they are willing to pay me a parking fee to stay on my property in addition to receiving the prize.? What about a personal moon trek to inspect his aging lunar rover? ?If you would have asked me that in 1993 when I acquired Lunokhod 2 I would have said pretty close to zero. It?s still a very low probability?but the probability is dramatically higher than it was,? Garriott said. The new private space race is going to be the fastest way to get people back to the moon, he stressed. ?As long as I keep myself healthy,? Garriott said, ?there?s reasonable odds I can get a chance to go visit it. It has gone from zero probability to just a long shot.? Long shots are not uncommon to Garriott, a career involving two major software companies as well as his space voyage to the International Space Station. ?So I?m willing to face some long shots,? he said.